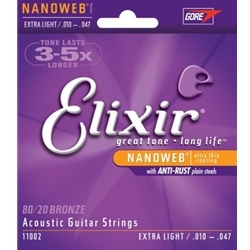 Elixir 11002 80/20 Bronze Extra Light Acoustic Strings are fun to play and last a long time. Elixirs are the first major innovation in strings in over forty years, and they deliver what they promise: great tone and long life no matter what you put them on or how often you play. Nanoweb coating permits acoustic guitar strings with the feel, bright tone, and punch of traditional strings.